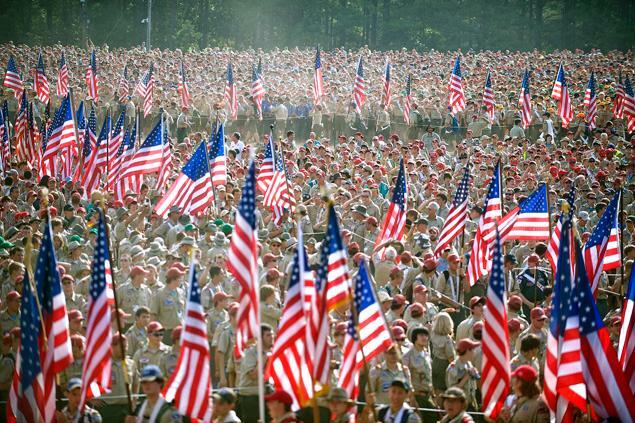 Boy Scouts from across America march with flags for the playing of the national anthem during the Boy Scouts of America 2010 National Scout Jamboree at Ft. AP Hill, Va. I realize you may be receiving a very high level of comments regarding this particular subject but I hope you will take time to consider my comments. As a parent, former scout, and now an adult leader involved actively with both the local Boy Scouts and Cub Scouts, I am very troubled by the recent announcement concerning the review of the BSA’s national membership standards. As a parent, the safety of the boys is paramount, the BSA expended considerable resources, time and effort not only creating the very best Youth Protection training, but also fighting the tough legal battle to allow the BSA to continue to follow those same principles it has held for 100 years. The allowance for openly gay, transgender, or otherwise described participants places the boys at great risk. Not only from pedophiles but also the more common and less discussed ephebophiles (adults who are sexually attracted to post-pubescent youths, generally aged 12 to 17.) With the door opened up you will have an increasing amount of leadership positions sought for this very goal and a decline in both the number of willing parents to volunteer, and more pointedly the scouts themselves will drop in number as their families wisely move them away from such dangers. Can you imagine the outcry if a single straight man was to lead a group of post pubescent teen girls? As a scout leader, I applaud the shift back to localism that this seems to create, but the real chaos will occur when those troop attend council, state and national events, Will the staff at those venues be held to any standard at all, and if so what will it be. I will not be sending my boys to an outing where there will be active homosexuals in close contact with them. With it already being difficult to find boys willing to actively promote their participation in scouts at the high school age, this choice will further ostracize them and be one more obstacle to climb over. So now what. They tossed out the initial plan and came back with this “compromise”. Frankly it’s bad policy no matter how one feels about this issue. Whomever came up with the idea should really explain WHY they think this is good for the growth of scouting, it’s legacy and mission. It’s a change that does little to help any of the issues confronting scouting today, and really makes it more difficult on everyone. In a practical way I don’t expect to see some massive rush of boys who wanted to be in scouts suddenly showing up and saying let me join in. Think it through, 70% of troops are charted by some from of “faith” based group, the adult leadership comes from that pool, and even in the other troops the BSA still requires all members to be Reverent and hold a faith in a higher power of some sort. Given that case, how many boys will want to join a group full of adults and boys who hold that their sexual desires are an unnatural abomination. Does the BSA somehow think that magically all the socially conservative adults that make up the core of scouting’s volunteers are just going to “change” with the wind. Do they really think that teen age boys are going to want to go camping with boys who find them “attractive”. I get that some folks were concerned about the decline in scouting’s numbers, but this issue does nothing to solve it. We as a nation are becoming soft, kids would rather (on average) play video games, or watch TV than step into the wild. Culture tells them this EVERY day. Scouting done right means getting outside, and an electronic culture is killing the manhood of our youth one digital bit at a time. No policy change could have fixed this. I don’t see this as a money issue either, with a dampened economy corporations will not be spilling cash back in the coffers anytime soon, (if ever) the Rabid Liberals will still hate the BSA until they allow adults who go against nature in as leaders. (really I just think they want to kill scouting altogether. If they wanted to make it better, they would just build their own group, fund it and make it “better” than the BSA.) If it was really a money issue, tack on $10 in membership dues, tell us why and we would have gladly paid it. Further, if someone asks how could I be a part of a group where they are okay with this abhorrent behavior… Well I still live in a nation that allows the murder of unborn children, calls fornication “cool” and makes it be “exciting” entertainment… I do so because Scouting is not the church, though populated by professed believers, it is not and can not be the church, Christ has but one, and he is the head of it, not some “key three” or a voting block at a rally. I did not at all mean with the immoral people of this world, or with the covetous and swindlers, or with idolaters; for then you would have to go out of the world. But actually, I wrote to you not to associate with any so-called brother if he should be an immoral person, or covetous, or an idolater, or a reviler, or a drunkard, or a swindler– not even to eat with such a one. I choose to follow this course knowing that where illness is, a healer is needed. I will stay as long as my sons want to participate and the pack/troop will have me knowing who I am and what I believe.